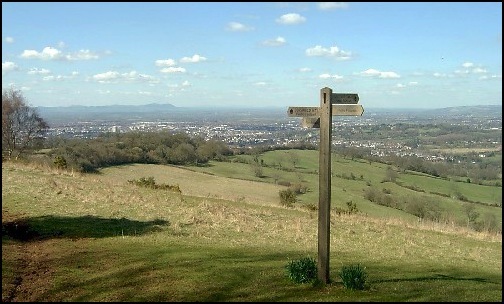 Walking bits of the Cotswold Way near Seven Springs, including Leckhampton Hill and Wistley Hill. 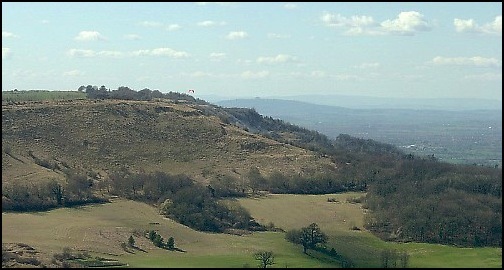 I first went onto the hillside above Cheltenham with “the Boys” in January 2003 when the weather was awful; we even had some sleet. However, I really enjoyed the walk, the area and the pub at Seven Springs, and since then I have walked in this area with Anne every year, always starting and finishing at Seven Springs. 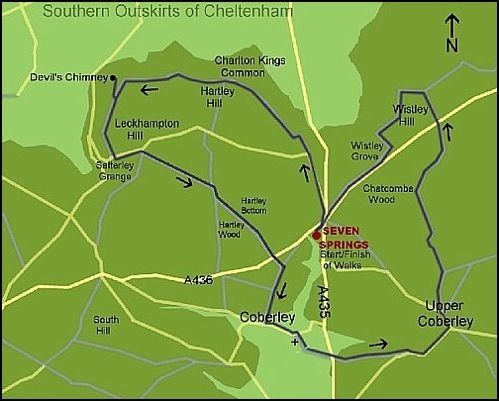 We have always done a shorter version of the original “Boys” walk; always following a clockwise route but missing out Upper Coberley and Crickley Hill and always followed the Cotswold Way off Leckhampton Hill and Hartley Hill to get back to our vehicle and food at the Hungry Horse Pub at Seven Springs. This year we thought it would be enjoyable to do an anti clockwise route and so the early part of our excursion saw us walking the Cotswold Way uphill northwards from Seven Springs to Hartley and Leckhampton Hills. 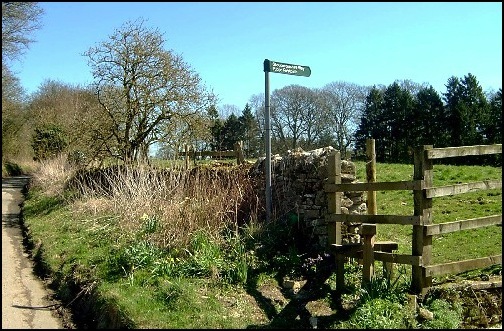 The Cotswold Way - Just north of Seven Springs. Click here to see our route, shortcuts and legend in a separate page. 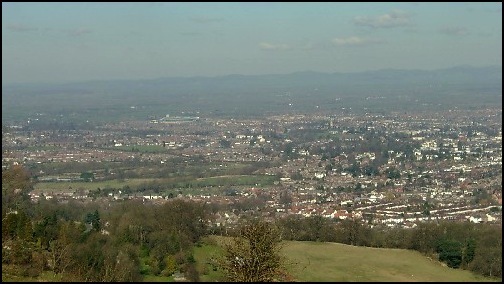 Nearing the top of Hartley Hill with good views over Cheltenham. 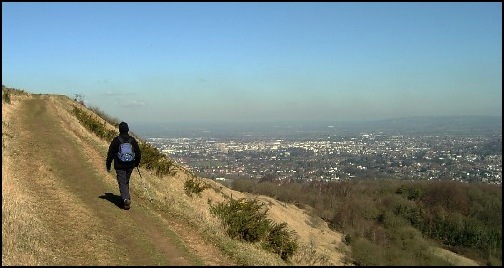 The walking was a lot easier than we expected - it always seemed much steeper coming down - and although the sun was out there was still a sharp chill in the air as we went up the hill with the views of Cheltenham gradually developing in front and to the right of us. From the top we were able to see very clearly many of the streets of the city and the donut shaped GCHQ with so many cars parked in its massive car park. Parascending above Charlton Kings Common. 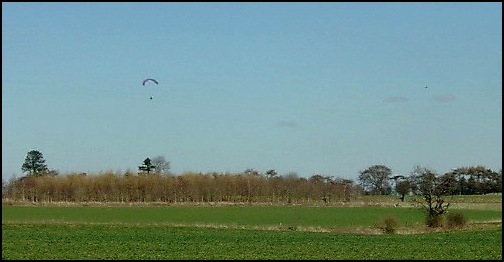 Alongside the path above Charlton Kings Common there were a couple of dozen men with “parachutes” ready to take advantage of the breeze and float upwards and get even better views of the surrounding countryside. However, we did not stop to watch but continued to the trig point and then the topographer near the top of Leckhampton Hill. And then it was downhill to make use of one of the many benches at the lower level of the hill where we enjoyed coffee and the views of Cheltenham below us and hills, including the Malvern’s, in the distance. The Trig Point on Leckhampton Hill. 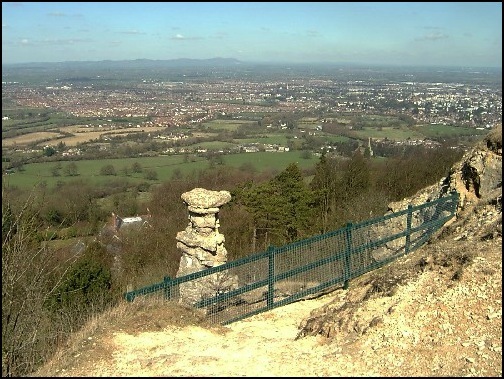 As always we stopped to look at the Devil’s Chimney and noticed that a much more substantial barrier had now been provided to stop people getting too close to it and possibly having a mishap. The Devil's Chimney - Now with a substantial protective barrier. From here we rejoined the Cotswold Way and followed it south off the hill to the lane near Salterley Grange. 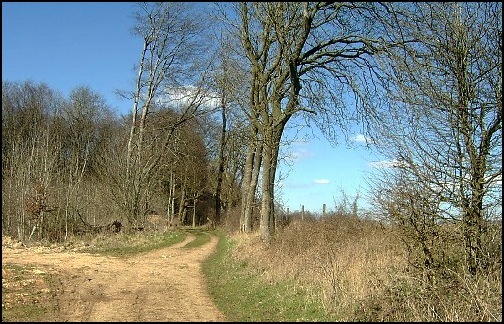 Here we turned left and followed the lane to the top of the hill and then followed the Cotswold Way to the right. 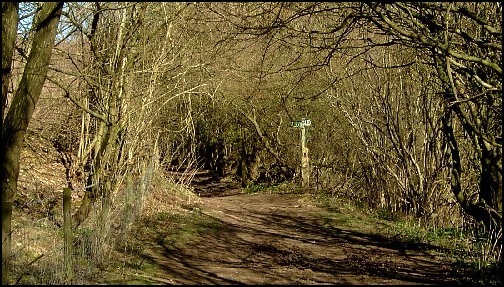 However once on the path we immediately went left off the Cotswold Way and followed a track to the right of the hedgerow that headed towards Hartley Wood and Hartley Bottom. This part of the walk was new to us and was generally less used than other paths we had walked in the area. But it was very pleasant and not only did we enjoy the countryside views but we noticed to our left one of the parascenders in the sky. Parascender seen from path on way to Hartley Wood. Our route gradually went downhill and, as the track we had been following went left, we went straight ahead through a gateway where the descent became steeper. At the bottom of the descent was a crossing of paths. Our route was straight on – south east – along a grassy area between two lots of woodland, with many of the trees looking exceedingly tired and grey. Even the sunlight could not improve them. Spring certainly was coming late this year. Hartley Bottom and Hartley Wood. Lifeless trees in Hartley Bottom. A little bit further on, as we came out from between the trees, I spotted a fox but before Anne could see him he had vanished into the wood. Looking back towards the "Hartley" Trees. Having crossed a stile our path followed to the right of the hedgerow until we came to the A436 about a third of a mile to the west of our starting point. However, it was too early to think about food so we crossed the road and followed the path that took us to Coberley. 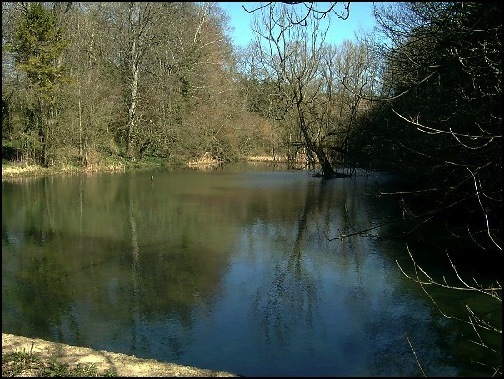 If you only have time for a short walk, after crossing the road and taking the path towards Coberley in about 50 metres there is a path left that will take you to Seven Springs without having to do so much road walking. This circuit is about 4 miles in length. Every time we have walked through Coberley the sun seems to shine. Today was no exception. At the start of our walk, because of the morning chill, we had wondered about wearing more clothes, but the afternoon was turning out to be really beautiful and as we walked eastwards along the road, which was also the Gloucestershire Way, we were getting very warm. 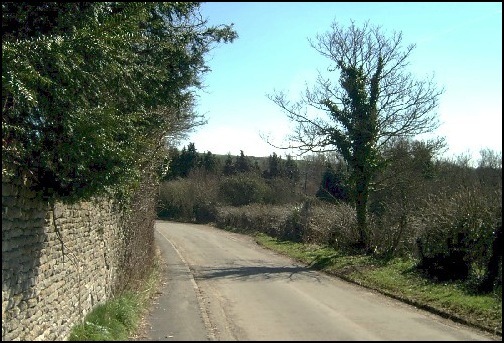 We left the road and followed the Gloucestershire Way when it turned right soon after Coberley Court and the entrance to the Church, which was hidden behind the roadside buildings. We now followed the Gloucestershire Way past a small lake and soon after followed the “Way” eastwards as it crossed a field and headed to the A435 – the Cirencester Road. The Gloucestershire Way just past Coberley Court. Reflections in the lake between Coberley and the Cirencester Road. Having crossed the road our path was straight ahead over a field to Upper Coberley. On leaving the field we passed through coniferous woodland before emerging into the village, where we turned left and walked along the main village thoroughfare and admired the very expensive looking houses that were being built, or being added to, on either side of the road. At the junction outside the village we turned left and could have followed the road, and later a track that would have returned us to Severn Springs. 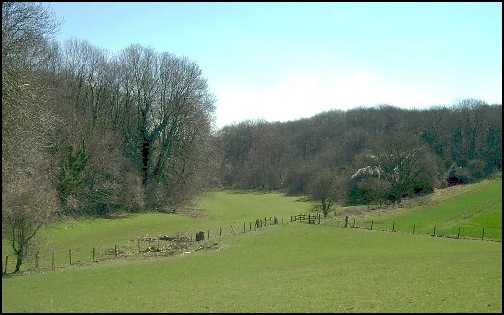 However we were keen to see some of the Cotswold Way to the east of Seven Springs and, with this in mind, we ignored the Gloucestershire Way when it turned right across fields and took the next footpath right, a few metres further on. 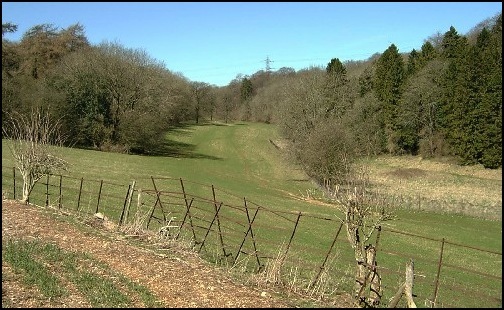 The route between the Cirencester Road and Upper Coberley. What was most noticeable about this area was the number of electric pylons that crossed the landscape. However, I did not check their routes as well as I should have and having entered and left a small wooded area we walked an about 50 metres in the wrong direction. However, by relating our path to the pylons shown on the map I realised the error of our ways and were soon crossing a ploughed field on course once more. A small amount of uphill work and we found ourselves on a track on the east edge of Chatcombe Wood. This was a really delightful part of the walk with the afternoon sun shining brightly. 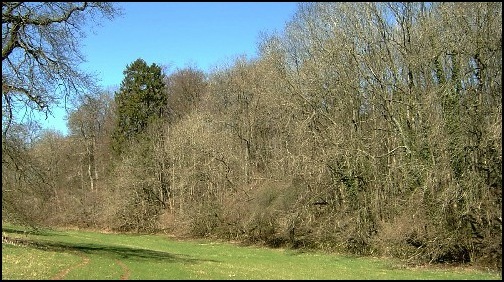 This woodland was obviously very well cared for and there were many signs of the timber being harvested in a planned manner. The start of Chatcombe Wood. The track soon passed a rifle range (shooting school), evidence of numerous broken clay pigeons could be seen, before we reached the A436 to the east of Seven Springs. Over the road we went, across a field heading for the gap in the woodland (Wistley Plantation) beyond. At this point we were nearly 300 metres above sea level so, as we came out of the trees, we had wonderful views towards the east of Cheltenham. We were now once more on the Cotswold Way. Turning left (west) we followed a signposted and obvious path which skirted the top of Wistley Hill and enjoyed the views north and west before the path descended to the road at Wistley Grove. 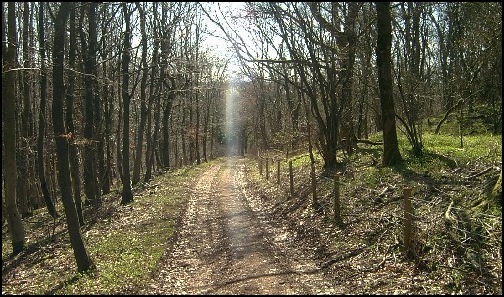 A ray of sunlight on our path through Wistley Grove. We had expected a little bit of road walking after Wistley Grove but our path was separated from the road by hedgerow before it reached the crossing of the A436 and A435. We were now back at Seven Springs and as the Hungry Horse Pub stays open all day we took advantage of its food and drink. The total route was about 8 miles in length and the map used was the Ordnance Survey Explorer Map – No 170 – for Gloucester, Cheltenham and Stroud.